Our mission is to provide personal, caring and knowledgeable advice to help you clarify financial goals and realize your financial dreams. Together we’ll go over your current and long-term financial needs in order to help you create a personalized investment strategy. We view each of our relationships in the context of a process that evolves over time. If your financial situation changes, we will always be ready to make thoughtful and relevant adjustments to your portfolio. Our primary commitment is your long-term financial success. 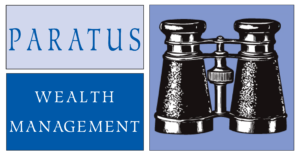 Paratus Wealth Management, LLC believes in flexibility. We will consider a wide range of investments before creating the portfolio we feel is best suited to your individual financial objectives and risk tolerance preferences. The types of investments utilized include stocks, bonds, mutual funds and ETFs, the mix of which will be tailored to specifically to you. We also will take into account what we believe to be the best opportunities available in the financial markets to assist in attaining your goals. Your objectives may include financing a comfortable retirement, your child’s education, a daughter’s wedding or many other goals that will bring you financial satisfaction and peace of mind. We want you to feel secure that your aspirations are attainable. We take great pride in our sound, consistent, professional advice and service.